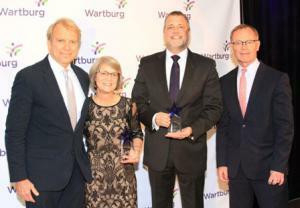 Wartburg, a premier senior residential and healthcare provider, was recently awarded the 2018 Innovation of the Year Award from LeadingAge NY, an organization that represents not-for-profit, mission-driven and public continuing care providers, predominately in senior care services for its pioneering SeniorU program. This program offers Westchester County retirees the chance to earn up to three free college credits from Concordia College this Fall on Wartburg’s historic 34-acre campus. “The Wartburg and Concordia College were recognized by LeadingAge New York for the creation of SeniorU, an innovative program offering college education for seniors in an affordable and accessible way. The Wartburg and Concordia College have made life-long learning a reality for seniors in Westchester County,” said Jim Clyne, President & CEO of LeadingAge New York. Combining the educational excellence of Concordia College with Wartburg’s expertise in senior care and services, SeniorU will give older adults the opportunity to engage in participatory classes designed with seniors, for seniors and taught by seniors with classes that relate to this part of their life’s journey. Classes include how to communicate with loved ones through social media, to move and breathe in ways that improve circulation and posture and how to share personal stories to make an impact on others. Participants will grow, share and learn in a community of learners of similar age. Classes begin on October 15 and are from 10am – 1:30pm 3 days a week for five weeks. Free lunch is provided. For more information please call Concordia’s Office of Admission at (914) 337-9300 x2152 or visit www.Concordia-NY.EDU/SeniorU.